Recipes - Entrees - Broiled Salmon Fillets - Salado Olive Oil Co.
Place Salmon, lemon zest, 1 tablespoon lemon juice, 1 tablespoon Salado House Olive oil or your favorite Salado Infused Olive Olive/Avocado Oil, and rosemary in a large zip-top plastic bag. Seal and turn to coat. Chill 30 minutes. Remove filets from marinade, discarding marinade. Place fillets, skin side down, on a rack coated with cooking spray in an aluminum foil-lined broiler pan. Whisk together remaining 2 tablespoons lemon juice and 1 tablespoon Salado Olive / Avocado Oil; drizzle evenly cooked over fillets. Garnish with lemon wedges. 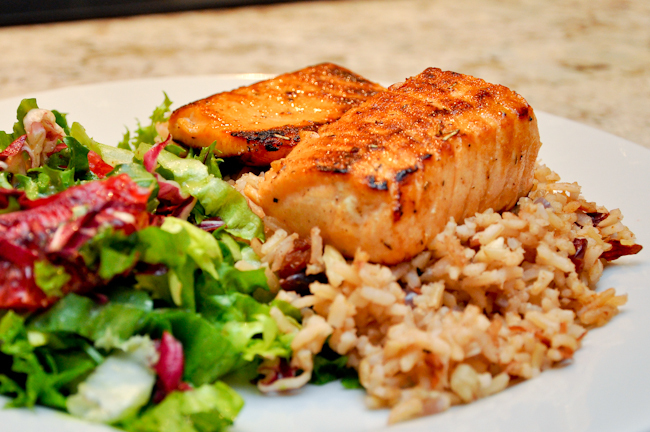 Serve over 2 cups of hot brown rice or 4 cups of uncooked arugula or baby spinach for a crisp salad.